I had the opportunity to play around with a Samsung Series 7 Slate, and regarding my experience I can be short: annoying in Windows 7, excellent in Windows 8! Regarding the hardware: the device is a little heavier than my iPad, but knowing that there is a computer running a desktop OS in it, I don’t mind. It is definitely fast, and most user reviews on the web were very positive. (Engadget, PC Advisor, CNET). And the looks are definitely okay. Regarding the software: Windows 7 is a good operating system as long as you have a physicial keyboard and mouse. The on-screen keyboard does not work comfortable in my opinion, especially not when working with your fingers instead of a “where-did-I-leave-it” stylus. Handwriting recognition was poor, and not available in my own language (Dutch). Windows 8 however, is a completely different experience. You will have to get used to the new UI (formerly referred to as Metro style), but once you get along with it, it is a huge improvement for tablet users. The keyboard is much more responsive to finger input, and the overall experience is also improved in that direction. 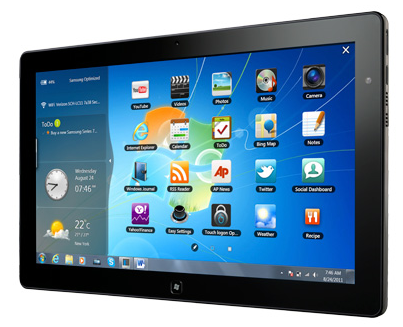 So for tablet users, Windows 8 is kind of a necessity – in my opinion. Now, how to install it? There is a good summary on Brad Wilson’s blog, and there is more info in this PDF file from Samsung’s website. To start, download the firmware update from this site (click on Manuals & Downloads, and then Firmware – you’ll find it at the bottom of the site) and run it. Next, download Windows 8 and Microsoft’s USB boot disc creator software. Create the boot disk, and shut down the tablet. Now, after pressing the power button, press the Home button (with Windows logo) once. Wait to get into the boot options menu, and go down (with the Volume down button on the device) to the last option to enter the BIOS if you do not get an option to boot from USB disk already. Go to advanced and enable UEFI boot. Then, exit BIOS (going right and left can be done with the volume buttons while holding the rotation lock button, and Enter is simulated by pressing that last button alone). Reboot, and do the same trick with the Home button. Now you can boot from USB and continue from there. In contrast to the info on Samsung’s website, I did not get any missing drivers message at the end. It all worked fine! Note: I formatted my USB disk as NTFS and had no problems booting from it (actually I did have problems with FAT32, but that was before the firmware upgrade and changing BIOS settings… I guess the trick is in these steps). Hi , thanks for the brief explanation. I was very helpful until i stuck in one level. In bios under the boot option “set boot priority; USB HDD :N/A”. So i can’t change the priority to usb and restarts end up with hdd boots. Would you please help?